All of this is to say that most accidents are preventable. The most preventable accidents nowadays are distracted driving accidents, particularly those where cell phones are the culprits. The ingenuity of tech-folks in finding ways for parents to combat youthful law-breaking is encouraging. One nice app we’ve come across is the Canary Project. It can notify parents when their child is in a speeding car or a car that goes out-of-bounds. It sends alerts when children talk or text behind the wheel. It can even “ping” your child so you know where he or she is at any given time. It costs somewhere between $10.00 and $15.00 for life. There are other apps out there, and one thing this one doesn’t do is block incoming calls and texts. There might be good safety reasons to keep that feature on, but we wish Canary gave parents the option. My kids aren’t old enough for cell phones yet, and they are certainly not old enough to drive. But, even at age 3.5 and 2, they have demonstrated love and aptitude for my cell phone, laptop and iPad. I didn’t grow up with the cool gagets that they will grow up, and I feel a strong pull from my cell phone when I’m driving. It’s going to be worse for them, and as a parent, my job is to protect them. 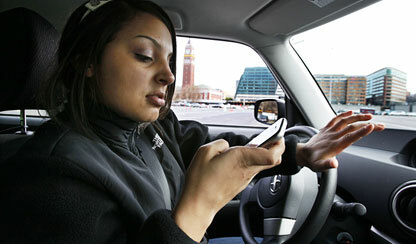 Questions about a distracted driving lawsuit? Contact our personal injury lawyers at 443.850.4426, or send us a message online.